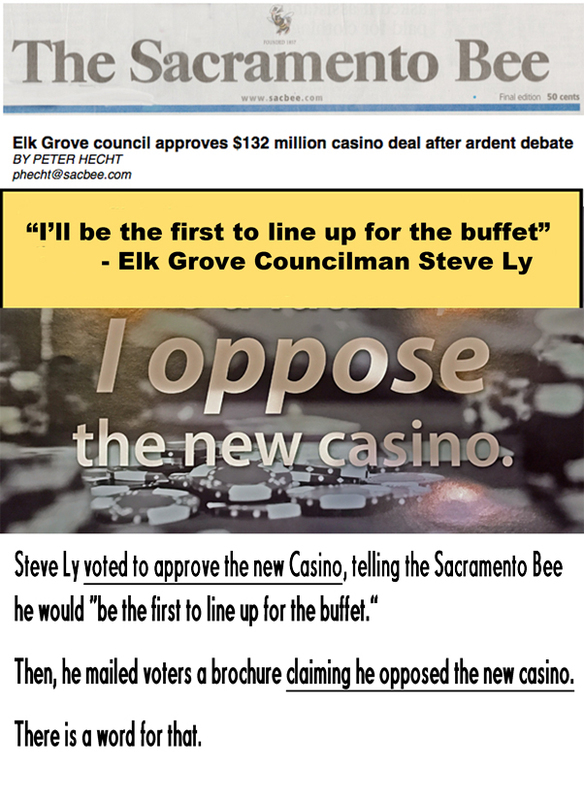 How honest was Elk Grove Mayoral candidate Steve Ly's recent "As a Father" casino mailer? According to an analysis by the Sacramento Bee's PoliGRAPH scale, it scored an "iffy" rating. The Bee grades politician's claims as either true, iffy, or false. On the front cover of his mailer read "As a father, I oppose the new casino." However, inside the piece Ly justifies his vote approving a change to a development agreement and terms to a financial arrangement with the casino proponent, the Wilton Rancheria, as making lemonade out of lemons. Ly uses a large font on the front of his mailer to emphasize that he opposes the casino. 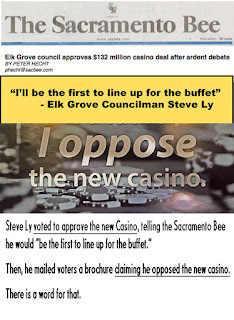 A voter who doesn’t open the mailer would be left with the impression that Ly is against the casino project, without the added context that he voted for the city’s $132 million agreement with Wilton Rancheria.